I wake up at 12:30 a.m. and sit straight up in bed. I reach over and turn on the bedside lamp. Something has touched me. Doc steps out of the bathroom to find me sitting up with the light on. “There’s something in our room,” I say. “Yes, I think it’s a mouse. I think it ran across my head.” Doc laughs. I find nothing funny about this. Doc climbs back into bed but I’m too hyped up now to sleep so I move into the living room to do some writing. Two hours later I fall asleep on the couch. We’re up again by 5 and ready to be on the road at 7. I open the door and look outside. It had rained heavily all night but this morning the skies are bright and clear. We’re meeting Doc’s son and family today. We know that they drove through last night’s rain and arrived at their campground very late. I’ve told Doc’s son, Mark, that we’d meet them at their campground around 9 a.m. 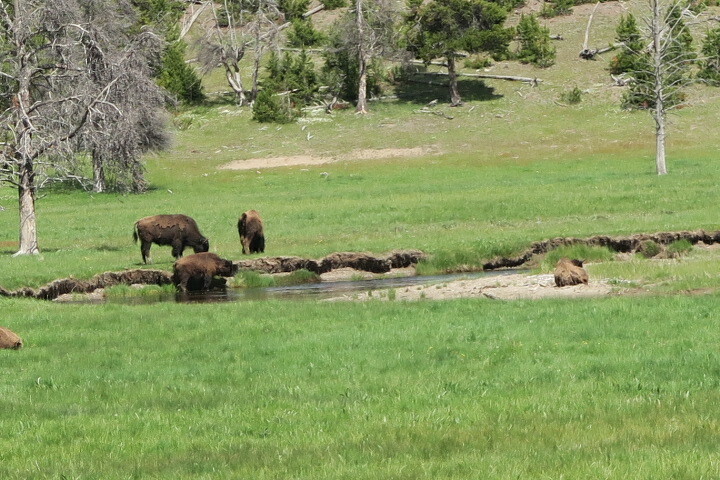 They are staying in Madison near the west entrance of Yellowstone. 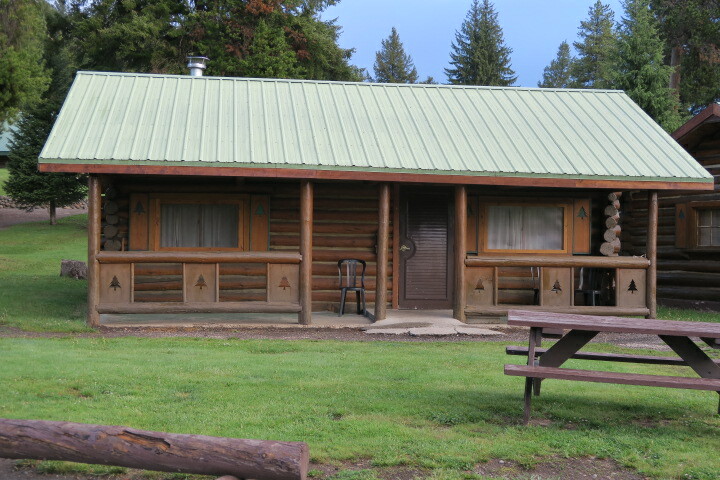 Our cabin is outside the east entrance. We expect it to take us 1.5 hours to drive between the two places. It actually takes us 2 hours to get there. When we arrive, Doc goes into the campground office to ask the attendant where the kids are parked. The attendant laughs and says that they must have arrived very late, after the office had closed, because they never checked in. He tells us to look for them in C-section. He also says that when we find them, we should tell them to come up and pay their fee. It doesn’t take us long to find them. We pull into C-section and spot their camper in the first space of the first row. Doc parks our own car and we all squeeze into Mark’s SUV with Mark and Kameron in the front, Doc and I in the two center seats, and the two girls in the back. 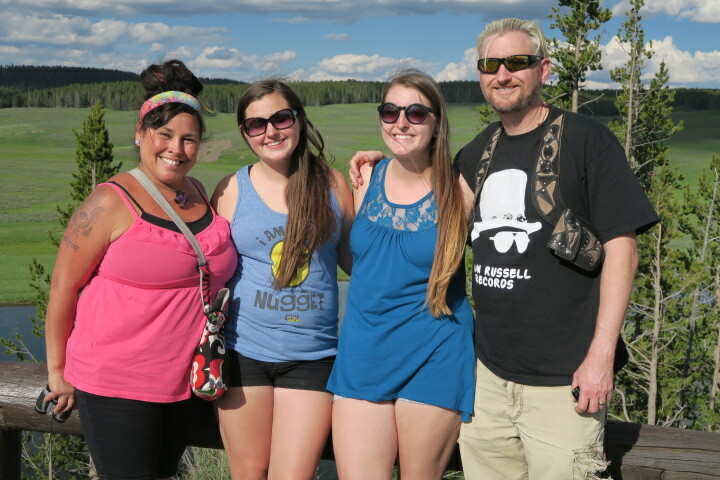 Our first stop of the day is at the Fountain Paint Pots where ground waters boil and mud bubbles. It looks like a pot of vanilla pudding cooking on a stove. 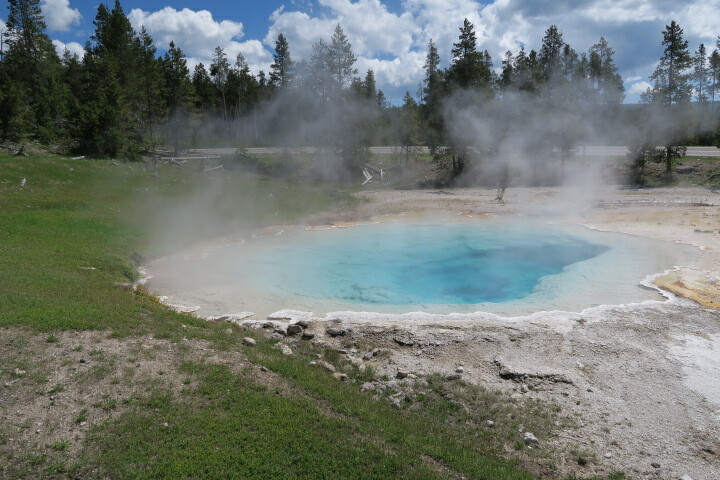 Pools of water glow turquoise blue against the white soil. We walk along the boardwalk and take lots of pictures. The air is heavy with the smell of sulpher. At Old Faithful we have lunch in the Inn’s dining room before joining hundreds of others standing around the geyser to wait for Old Faithful to perform. 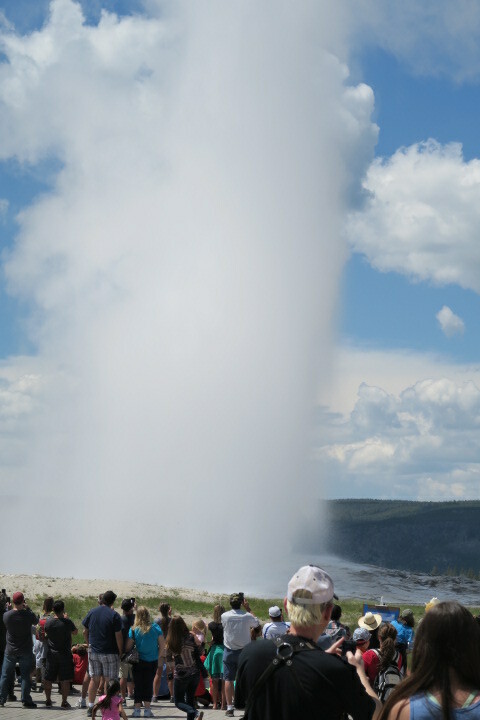 Old Faithful is no longer her faithful self and eruptions no longer happen like clockwork as they used to. It’s 1:50 p.m. A ranger has given us an eruption window of 2:03 to 2:23 p.m. We wait. The sun is hot and we all spread on sunscreen though it’s a bit too late. All of us are already on the way to being sunburned. Old Faithful’s water reaches higher than I remembered and the eruption lasts longer. Hundreds of people lining the sidewalk scurry to take their photos and selfies. 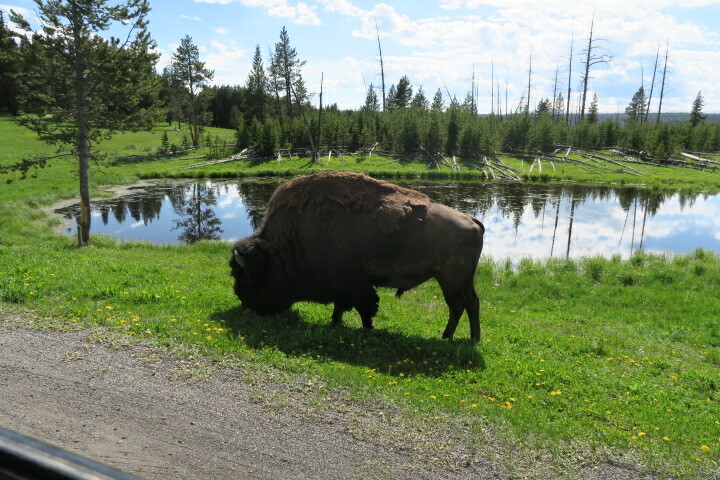 We continue along the Grand Loop Road and spot a herd of buffalo grazing in a green valley. There are lots of new calves with their mothers. We watch as a bull that is walking down the center of the road gets aggravated with the traffic and makes a charge at a small blue car. The girl driving hits the gas and moves out of the way just avoiding a bullhorn going through a tail light. Other people foolishly approach the herd to get close-up pictures. Buffalo may look slow and lazy but they can run at an amazing speed when they want to. As we stand back and watch, we’re told that two people have been gored in the past week. We see another group of people standing at the side of the road. All of them are equipped with huge cameras on tripods that are all pointed at the same large rock. Doc and I had seen this same group of people staring at the same rock hours earlier. No one has moved since morning. We stop and ask what they are looking at. A mother wolf, we are told, has had a litter of pups under the rock. Everyone is waiting for the new pups to emerge. Could be a very long wait, I think. What makes anyone think they will come out while 20 people are standing within 10 feet of their exit? At the end of the day, Doc and I start back for our cabin. It’s dusk, the best time to see animals that have been hiding out during the heat of the day. 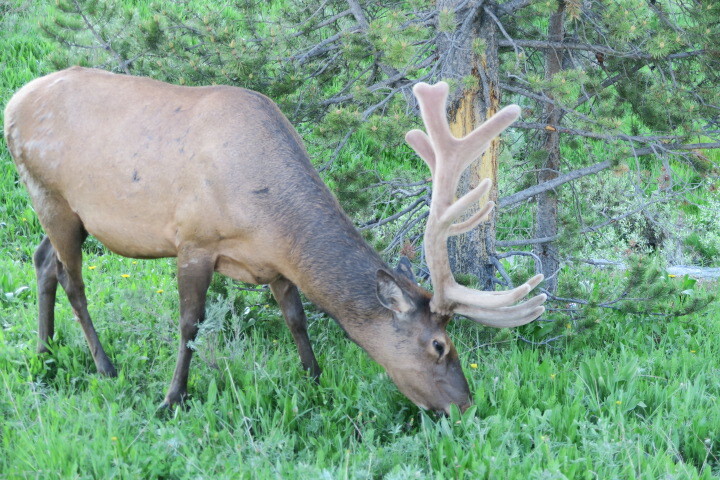 In Hayden Valley we stop to watch four elk grazing at the side of the road. 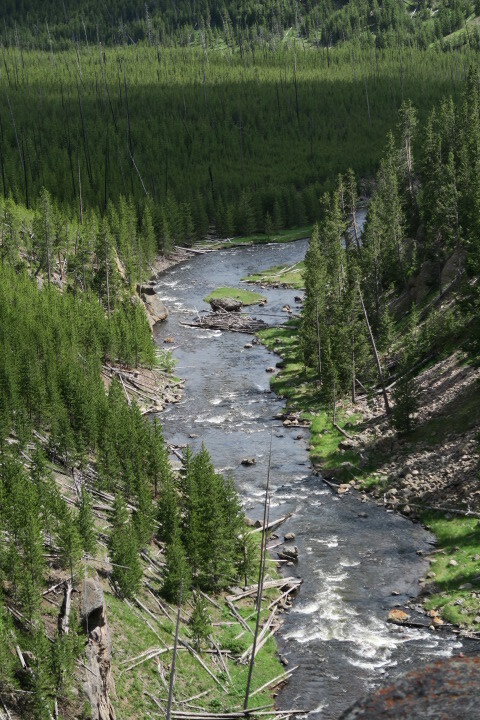 Within ten minutes we spot a grizzly bear on the opposite bank of the river. 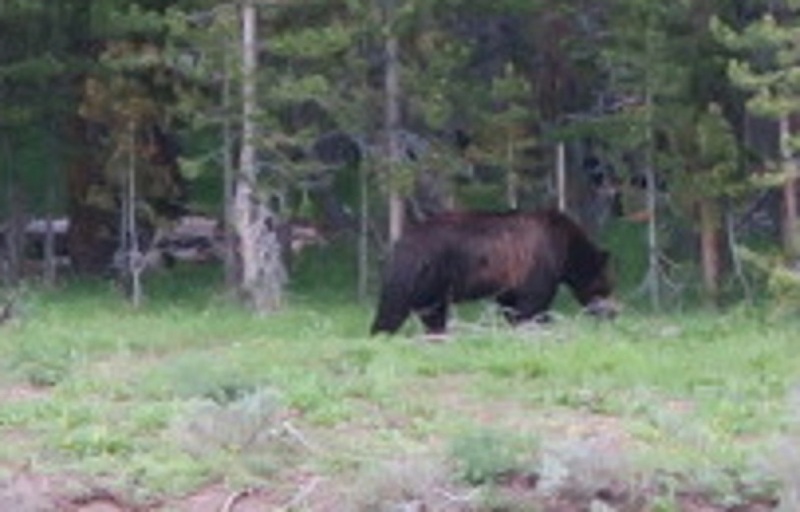 A grizzly is a rare site even in Yellowstone. He looks huge, even at this distance. I snap a photo and we watch until he disappears into the forest. Almost immediately, we spot a second grizzly much farther across the valley but he is so far away that he amounts to little more than a speck on the camera lens. Back in our car, traffic has stopped. No one is pulling off to the side of the road. Strange. We wait. Finally, a line of cars drive toward us from the opposite direction. When our lane starts moving again we realize there has been an auto accident. Not surprising with so many cars dashing in and out of turn-offs, fighting for roadside parking space, and stopping short in the roadway whenever a driver spots some animal of interest. No one ever seems to be looking at the road. We get as far as Canyon Village and decide to get some dinner. We step into the cafeteria for a fast meal and we both order the “visitor’s favorite” chicken cacciatore. Clearly, this is a “visitor’s favorite” because so many people order it and not because so many people like it once they get it. The meal is dreadful but at 8 p.m. it is our final chance to find food. The restaurant at Pahaska will be closed by the time we get back there. We eat just enough to get us through until morning. Most of our $25 heads for the waste bins. It’s nearly 10 p.m. when we arrive back at our cabin. Doc walks over to the lodge to get the evening’s basketball score. The Cleveland Cavs have lost. I am exhausted and climb immediately into bed, hoping that our resident mouse won’t make any more appearances.